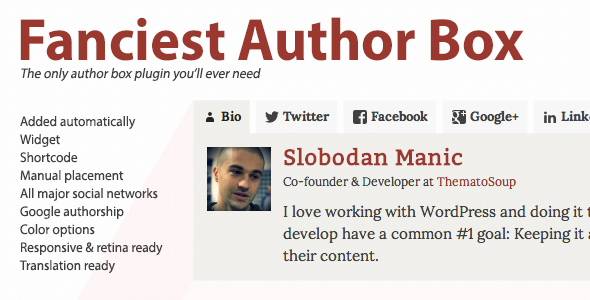 Fanciest Author Box is a premium WordPress plugin developed by ThematoSoup. 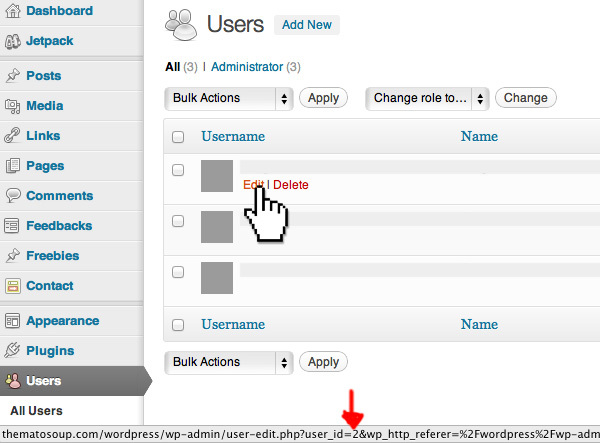 It blends into WordPress UI perfectly and uses WordPress Settings API to store its settings. 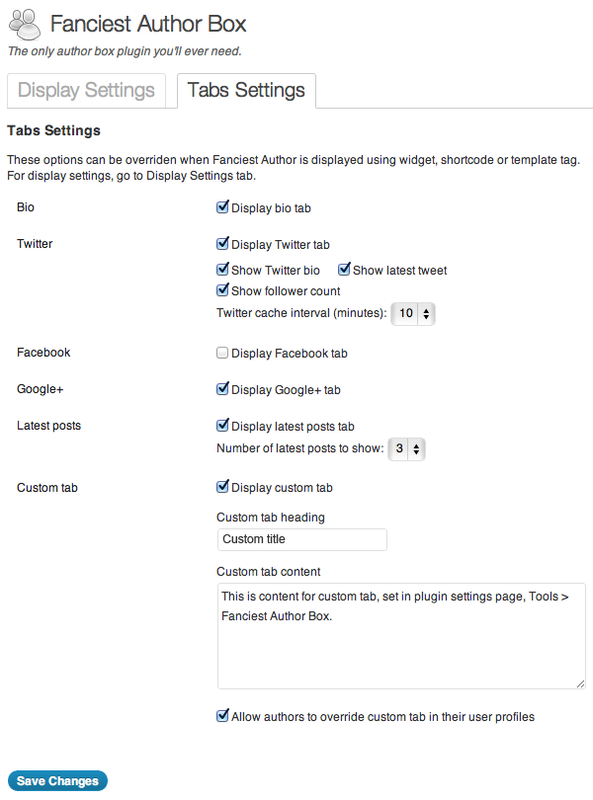 Tabs Settings page in Fanciest Author Box settings allows you to select which tabs you’d like to show. Additionally, you can specify which tabs to show in widget settings or by using shortcode and template tag parameters. User image used in all tabs is pulled from Gravatar, unless user Photo URL is specified in User Settings. If you’d like to upload a custom user image, you can upload it at Media > Add New screen and then copy its full URL into Photo URL field or just hit an upload button in Users > Your Profile > Photo. First you need to unpack codecanyon-2504522-fanciest-author-box.zip. Once the new version gets released, you can update the old one simply by overwriting your wp-content/plugins/fanciest-author-box folder with the newer one. This way, you preserve your user details. note: Do not uninstall and then reinstall the plugin, because this way your user details will be deleted. You can find Fanciest Author Box Tabs Settings in Settings > Fanciest Author Box > Tabs Settings. 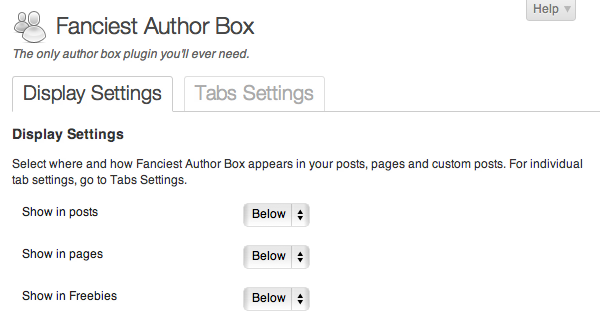 Tabs Settings can be used to set global options for Fanciest Author Box tabs. note: Global options are also used as defaults (if nothing else is specified) in widgets, shortcodes and template tags. Uncheck this to prevent showing bio tab. Uncheck this to prevent showing Twitter bio in Fanciest Author Box Twitter tab. Uncheck this to prevent showing latest tweet in Fanciest Author Box Twitter tab. Uncheck this to prevent showing follower count in Twitter Follow Button in Fanciest Author Box Twitter tab. Because of Twitter API limits (150 requests per hour) all data that is fetched using Twitter API is cached, each user getting one cache object. For example, if you have a 15 author website, you can allow 10 requests per hour, per author at most. In this case setting Twitter cache interval to 10 minutes makes sure that your website will not make more than 90 (15*60/10) requests per hour, preventing you from topping Twitter API limits. Uncheck this to prevent showing Google+ tab. Uncheck this to prevent showing latest posts tab. This field allows you to specify number of latest posts to show in latest posts tab. Uncheck this to prevent showing custom tab. Use this to set heading for custom tab. Use this to set custom tab content. Several HTML tags are allowed: a, blockquote, br, em, ol, ul, li, p, strong and img. If this option is checked, it will add custom tab title and custom tab content fields to User Profiles, allowing them to override custom tab set by administrator in Tabs Settings page. note: Fanciest Author Box will work just fine even if users don’t supply any additional info. However, if a user doesn’t enter Twitter, Facebook and Google+ details, Fanciest Author Box will only show two tabs – Bio and Latest posts. 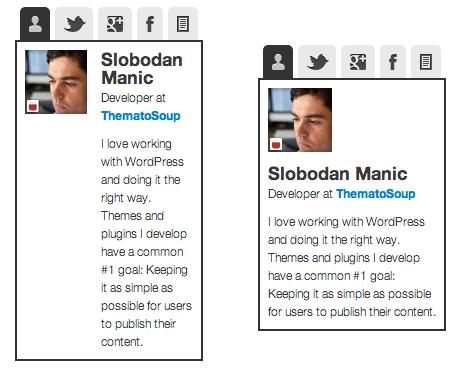 Users can find their own Fanciest Author Box User Details section in Users > Your Profile. Administrators can access Fanciest Author Box User Details for other authors in Users > All Users > Edit (Edit link appears when you mouseover a user). Twitter username – If a user leaves this empty, Twitter tab will not show in his/her Fanciest Author Box. Since version 1.1 it is possible to select from Follow and Like widgets. Subscribe/Follow is used for personal profiles, while Like can be used for Facebook pages, allowing users to promote their business, while keeping their personal profiles private. Facebook username. If a user leaves this empty, Facebook tab will not show in his/her Fanciest Author Box. Additionally, to show Subscribe button in Fanciest Author Box, user must first allow subscribers in Facebook profile. Google+ ID. 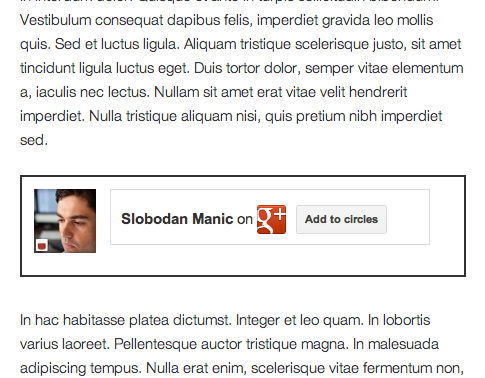 If a user leaves this empty, Google+ tab will not show in his/her Fanciest Author Box. Work position. Shown under name in Bio tab. Shown under name in Bio tab. Used to add link to Company. Shown in Bio tab. If this field is left empty, Company will be shown as plain text, instead of link. If Display custom tab and Allow authors to override custom tab in their user profiles in Tabs Settings are both checked, two additional fields will show, allowing individual users to override custom tab title and content set by site administrator in plugin settings page. Several HTML tags are allowed in custom tab content field: a, blockquote, br, em, ol, ul, li, p, strong and img. 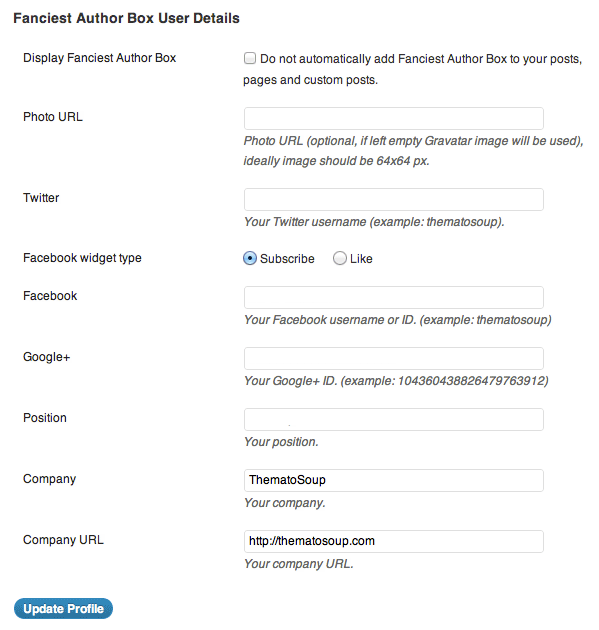 With some outside the box thinking, you can also use Fanciest Author Box to display Twitter, Facebook or Google+ social widgets. Using same logic, you can display Facebook Subscribe button, Twitter Follow button, your latest post or your bio anywhere you want. Another way to do it is using template tag, also passing only one tab to $tabs parameter. Each one of those has three color fields – background color, border color and text color. 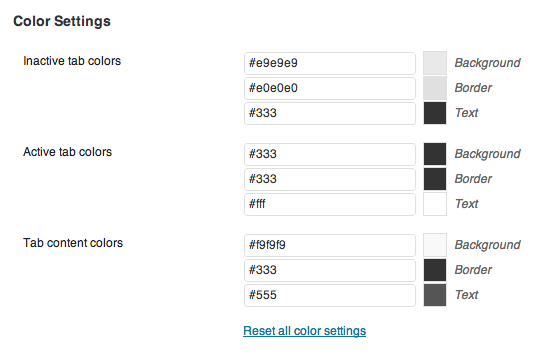 For each field you can either type color hex code into the input field or select a color using color picker. 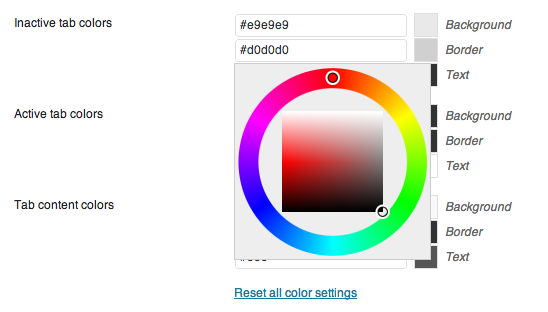 Clicking colored square next to an input field will display color picker. After changing colors click Save Settings to update the fields. Clicking Reset all color settings link will revert all color options to default. After clicking the link you will not be able to revert to your custom settings! After resetting, click Save Settings button to update the fields. Upon Fanciest Author Box activation, it will be automatically added below all posts, pages and custom posts. These settings can be changed in Settings > Fanciest Author Box screen. For posts, pages and all registered custom post types, you can select whether you’d like to show Fanciest Author Box above, below, both above and below posts, pages and custom post types or not show it at all. 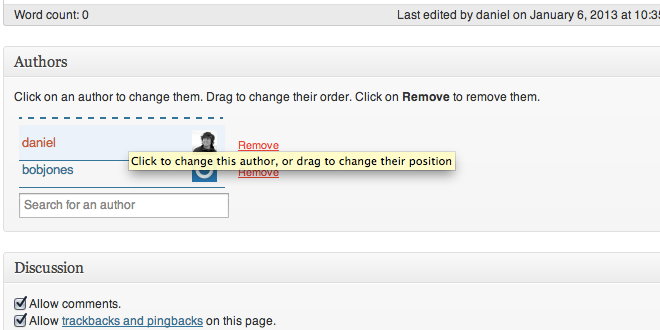 Each user can override this option for his/her posts in Users > Your Profile > Fanciest Author Box User Settings. 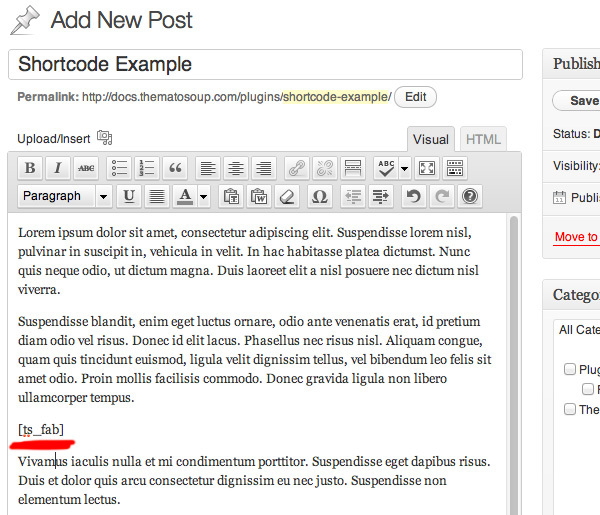 Fanciest Author Box can be disabled for individual posts or pages by using ts_fab_hide custom field. All you need to do is enter a value for that custom field and the author box will not be automatically added. Any value will do, as long as custom field exists and is not empty. See if the box still shows on that page. Fanciest Author Box can also be added to your website as a widget. In order to use it this way, your theme must be “widget ready” and have at least one widgetized sidebar. Widget title, defaults to “Author Spotlight” if empty. Only checked tabs will be displayed in Fanciest Author Box widget. Dropdown list of WordPress users. Determines which user to use for Fanciest Author Box. Useful for narrow sidebars. If unchecked, user photo will be displayed above all other data. If checked it will be floated on the left side. If you’re 100% unfamiliar with WordPress shortcodes, here’s a brief explanation of how they work. Insert that into your post content and author box for author of the post you’re adding it to will be displayed, showing tabs you defined in Tabs Settings. What this tells WordPress is to display author box for user whose user ID is 10 and show bio, latest posts and Twitter tab, in that order. They need to be passed as comma separated string (see example above). note: This information is only useful for WordPress theme developers. If you’re not familiar with PHP code, you can still add Fanciest Author Box to your posts automatically, using a widget or using shortcode. Function is wrapped in function_exists check to make sure your theme doesn’t break when you deactivate Fanciest Author Box plugin. $context (optional) – text string that is used to construct Fanciest Author Box wrapper ID, for example, if you use ‘author-page’ wrapper element ID will be ‘ts-fab-author-page’. $authorid (optional) – integer, user ID, see how you can find any user’s ID at the bottom of dding Fanciest Author Box using shortcode page. $tabs (string) – comma separated string of tabs to include, values you can use here are: bio, twitter, facebook, googleplus, latest_posts and custom. You need to install both plugins, go to the post which is co-authored and underneath the editor you’ll find Co-Authors Plus meta box. This is were you assign authors for your posts/pages. Once you do this, Fanciest Author Box will automatically show the author boxes. Since version 1.7 we introduced a filter which you can use to pull your author info from other plugins and present it in Fanciest Author Box. The filter ‘ts_fab_social_field’ allows you to modify which user meta fields are used for social tabs. You can find uninstall (delete) option after you deactivate the plugin from the Plugins page. Keep in mind that when you delete Fanciest Author Box you will also delete all of its settings as well as Fanciest Author Box user settings. If you only deactivate the plugin, its settings will remain and will not need to be entered again if plugin is re-activated. For support requests please use our Support Forums. If you like the plugin, please take the time to rate it. It means a lot us.